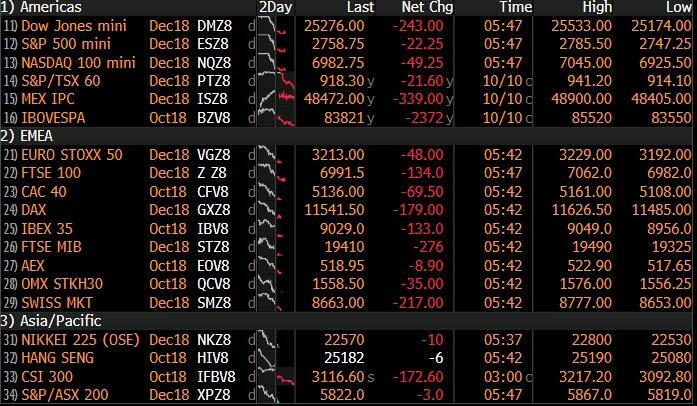 It is a sea of blood red this October morning as the biggest market rout since February and the longest selloff of the Trump administration triggered a surge of global selling from the U.S. through Asia and spreading to Europe on Thursday, with markets from Tokyo to London slumping amid fresh fears the decade-old bull market may be coming to an end. The sell-off that started in the U.S. ripped across Asian stock markets Thursday, with indexes in Japan, Hong Kong and China all tumbling. All but one stock listed on Japan’s Nikkei 225 Stock Average retreated, while the country’s Topix index posted its steepest decline since March losing around $207 billion in market value, falling 3.5%. China’s Shanghai Composite sank 5.2%, its biggest drop since February 2016 to close at its lowest since November 2014, while the Hang Seng Index lost 3.5%. Taiwan’s Taiex index led the rout with a 6.3% slump. 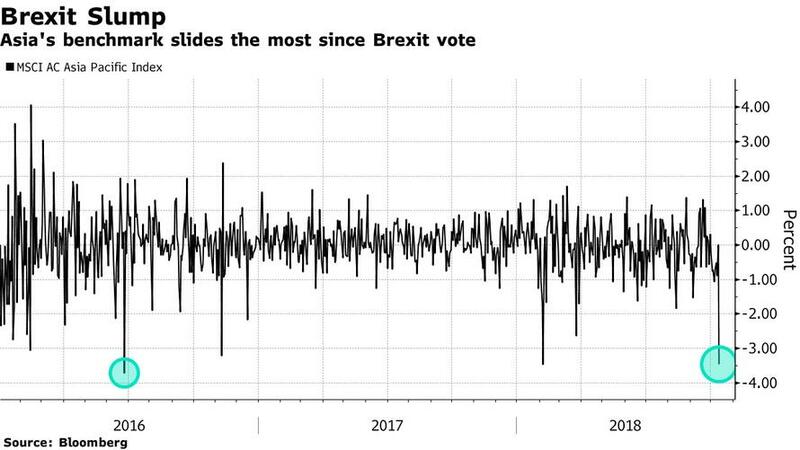 The MSCI Asia Pacific Index had its worst day since June 2016, when the U.K. voted to leave the EU, with the index plunging 3.5% and closing in on entering a bear market. The Asian regional benchmark gauge has slumped 13 percent this year as uncertainties such as the U.S.-China trade war weigh on investor sentiment. The Shanghai Composite Index has lost 22 percent in 2018, while Japan’s Topix is down 6.4 percent. "It’s just a beginning," said Banny Lam, head of research at CEB International Investment. "The U.S. tech bubble may take a while to burst and we are facing many external uncertainties - trade wars, risks in emerging markets currencies and oil price. And people should also watch yuan closely." The Asian rout then spread to Europe, where stocks slumped to a more than an 18-month low. Losses in London, Paris and Milan were already climbing toward 2% in early trading, although the selloff wasn't quite as dramatic as the overnight session in Asia. Italian equities entered a bear market, however, on ongoing budget concerns and LeasePlan Group NV pulled a planned IPO. 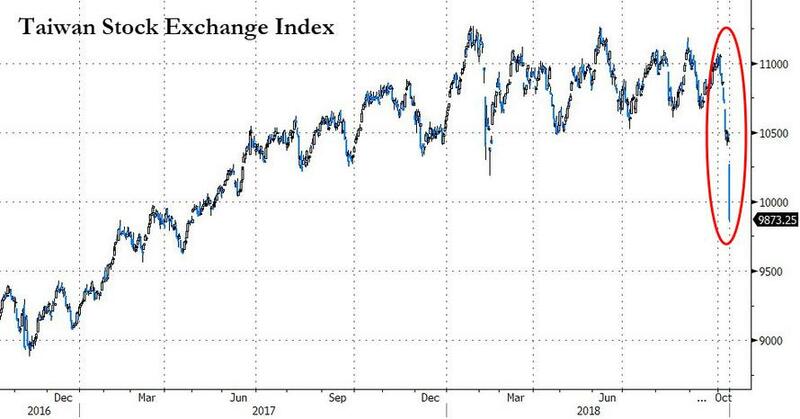 As a result of the global rout, MSCI’s 24-country emerging market index was having its worst day since early 2016, after Wall Street’s swoon had given the 47-country world index equivalent its worst day since February. 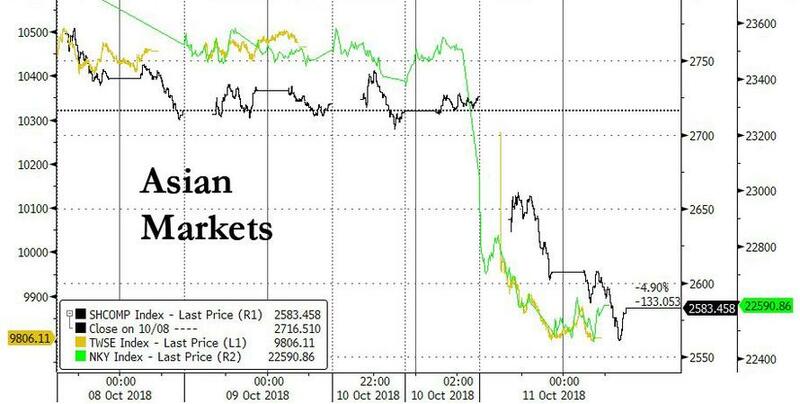 Meanwhile, in a surprising reversal from previous routs, US futures failed to rebound as dip buyers stayed away from the E-Mini. 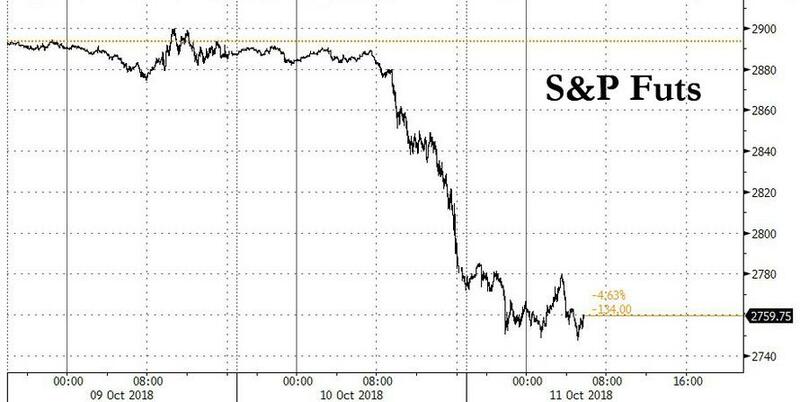 S&P futures extended losses from Wednesday, when the Nasdaq 100 Index plunged more than 4% for its worst day in seven years. The futures drop took place after the S&P500’s sharpest one-day fall since February wiped out around $850 billion of wealth as technology shares tumbled on fears of slowing demand. The S&P 500 ended Wednesday with down 3.29%, wiping out nearly half the year's gains in one session; the Nasdaq Composite plunged 4.08% and the Dow 2.2%. Investors seeking to isolate the cause of the current rout in equities have no shortage of culprits: U.S companies are increasingly fretting the impact of the burgeoning trade war, while the same concern prompted the IMF to dial down global growth expectations for the first time in 2 years. In the tech sector, which was a key driver of the rally that pushed American equities to a record just a month ago, expensive-looking companies have been roiled by a hacking scandal. 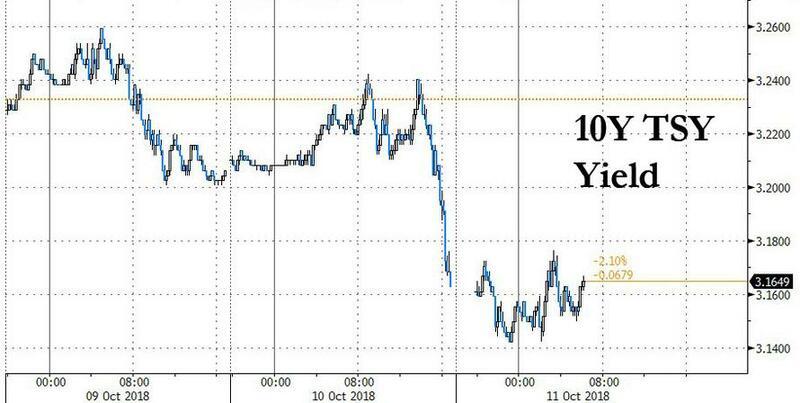 Curiously, Treasuries which helped trigger the stock selloff when 10-year yields hit the highest since 2011, nudged higher after jumping on Wednesday as bonds have once again become a safe haven. It meant that as equities were caught in a global carnage, US Treasurys were oddly calm, with the 10Y generally unchanged overnight. Meanwhile, bunds and gilts led advances amid the broader risk-off mood. The shift in yields is also sucking funds out of emerging markets, putting particular pressure on the Chinese yuan as Beijing fights a protracted trade battle with the United States. China's central bank has been allowing the yuan to gradually decline, breaking the 6.9000 barrier and allowing traders to push the dollar up to 6.9431. Sinking global shares have raised the stakes for U.S. inflation figures due later on Thursday. High inflation would only stoke speculation of more aggressive rate hikes from the Federal Reserve. In commodity markets, gold struggled to get any safety bid and edged down to $1,192.77. Oil prices skidded in line with U.S. equity markets, even though energy traders worried about shrinking Iranian supply from U.S. sanctions and kept an eye on Hurricane Michael, which shut down some U.S. Gulf of Mexico oil output. Brent crude fell 1.6 percent to $81.75 a barrel. U.S. crude dropped 1.5 percent to $72.07. 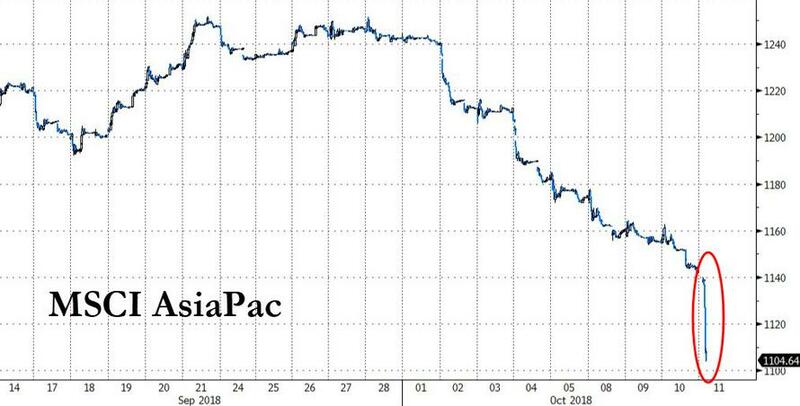 A Bloomberg index of cryptocurrencies dropped as much as 11%. Scheduled earnings include Walgreens and Delta Air Lines. CPI figures, jobless claims are among economic data due. 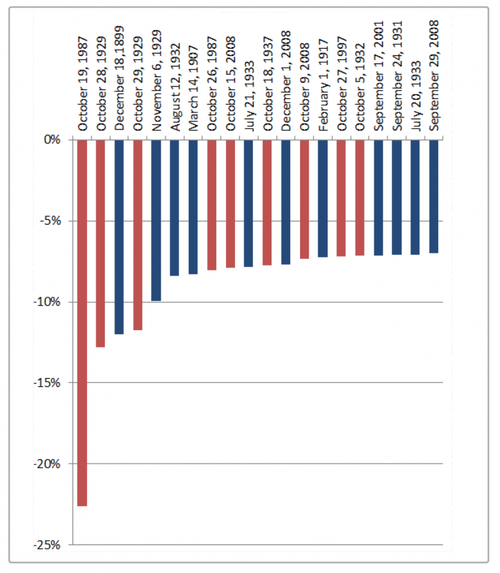 Finally, one wonders just what is it about October, when half of the biggest US market crashes have taken place. Asian stocks drowned in a sea of red following the battered lead from Wall St. amid a sell-off in tech stocks where the sector posted its worst day since 2011. Dow and S&P notched their biggest one-day drop since early February, while Nasdaq fell below its 200 DMA to experience its largest single-day decline since June 2016. ASX 200 (-2.5%) was dragged lower by the tech sector, closely followed by the energy names, while Nikkei 225 (-4.0%) plumbed the depths amid weakness in mining and energy names alongside currency effects. Elsewhere, Hang Seng (-3.7%) and Shanghai Comp. (-4.3%) dived deeper into bear-market territory in a continuation of the tech sell-off, with the former hitting lows last seen in February while the latter tumbled to 4-year lows. Major European indices are all in the red due to the global market turmoil which began on Wednesday in U.S markets (Euro Stoxx 50: -1.3%), the cause has been quoted as a multitude of factors not limited to; US-China trade tensions, the current yield environment, the Italian political situation and suggestions that the markets were overdue a correction. However, it is yet to be seen whether this is part of a broader economic downturn as we enter into U.S earning season with a relatively solid U.S economic backdrop. All sectors are down with energy firms down by over 2% in fitting with price action in the complex. Healthcare and consumer staples are the best performing sectors as more defensive investments are sought in the risk-off environment, but are both in the red by just under 1% Dialog Semiconductor is vastly outperforming, up over 23%, following a EUR 600mln deal with Apple, which has led to the company updating their revenue outlook for the next 4 years. Ingenico are also up over 12% after confirmation that Natixis (-4.5%) are in the early stages of take over discussions. Hays Plc are at the bottom of the Stoxx 600, down by 12% after reporting a slower quarterly growth rate. In commodities, both WTI and Brent are down by 2% at just under USD 72/bbl and USD 82/bbl respectively with prices hampered by the risk-off environment as investors are concerned following global growth uncertainty and ongoing trade disputes. This comes alongside API’s reporting a larger than expected headline build of +9.75mln offering pressure on the fossil fuel. Supply concerns from Hurricane Michael are also easing as oil assets were likely spared significant damage from the storm. Gold is up 0.3% as investors seek safe havens from the current global dip, gold has subsequently breached USD 1200/oz to the upside. Base metals also fell again amidst the broader global risk sentiment with underperformance seen in copper. Days like yesterday, although brutal, restore one’s belief that at this stage of the rate cycle things should start to get more difficult and more volatile even if the center (the US economy) is still likely to hold for now. In fact it’s been our thesis that the US economy at risk of overheating is partly what’s going to drive volatility up. So with that in mind today’s US CPI comes at a fascinating point. Before reviewing that let’s review the wreckage from yesterday. The S&P 500 (-3.28%) and DOW (-3.15%) both had their worst days since the February market correction and the NASDAQ (-4.08%) shed the most since June 2016. The S&P 500 has now traded lower for 5 consecutive sessions, shedding -4.77% over that period, its longest such stretch since March. Every S&P 500 sub-sector traded lower amid generalised risk-off sentiment, but the FANGs (-5.60%) continued to underperform, saw their worst day since March and are now down -17.86% from their June peak. Volatility spiked, with the VIX index up 7.01pts and closing at its highs around 22.96, a six-month high. Using another measure of vol, this year we’ve now had 6 days with the S&P 500 falling more than 2% - the most since 2011. 2017 had none. Perhaps tellingly, Treasuries yields were higher all day until a mini plunge started with 10 minutes left of US equity trading. They traded around -4.3bps lower for the day at 3.164% at the close. In Asia overnight they are at 3.147% as we type. US HY had been the most expensive part of the credit spectrum in our view and was at 9 month tights 2 weeks ago but has been selling off of late. CDX HY widened 18.1bps yesterday and is now around 46.7bps wider than the late September tights and back nearer the top end of the YTD range. On the equity sell off the big names in the US administration had their say. US Treasury Secretary Steven Mnuchin said, “the fundamentals of the U.S. economy continue to be extremely strong, I think that’s why the stock market has performed as well as it has. The fact that there’s somewhat of a correction given how much the market has gone up is not particularly surprising” while President Trump also said that the stocks decline was “a correction that we’ve been waiting for for a long time.” However, Trump stepped up his rhetoric on Fed saying that it is making a “mistake” by raising rates and “has gone crazy” while adding that yesterday’s market plunge wasn’t because of the US trade war with China. This morning in Asia, the risk off sentiment has continued from Wall Street with all equity indices trading in sea of red and bumping around the lows for the session as we type. The Nikkei (-4.28%), Hang Seng (-3.74%), Shanghai Comp (-4.34%), ASX (-2.40%) and Kospi (-3.61%) are all down but in these fast markets things might have changed again by the time you read this. In other markets, Taiwan’s Taiex (-6.23%), India’s Nifty (-2.78%) and Indonesia’s Jakarta Comp (-1.67%) are all heading lower. Elsewhere, futures on S&P 500 are down another -0.66%. Overnight, BoJ board member Makoto Sakurai called for the central bank to assess the sustainability of its easing policy from a much wider perspective indicating that the policy tweaks in July haven’t put to bed concerns over side effects. She said that the BoJ needed to keep in mind the risk of distortions building up in the economy and the financial sector if the easing policy is prolonged in a favorable economic environment with demand exceeding supply. Today will be a key test for markets with US CPI set to dominate attention. The consensus doesn’t expect much to happen, but then again it rarely has for this data print over the last few years. The consensus forecast is again at +0.2% mom for the core for the 36th successive month. DB is at +0.25% mom so we think it could round up to 0.3%. Before the recent risk-off, I would have automatically said that the downside risks to the market from an upside inflation print were much larger than the upside market risks from a downside surprise. However, given the recent risk sell-off, you’d have to say that there is scope for a decent relief rally on a softer number. Medium-term though, signs of higher inflation would be much worse for risk than softer inflation would be positive. Back to yesterday and in Europe a number of markets hit YTD lows with the DAX (-2.21%) at the lowest since February 2017 and experiencing the 5th worst day of the year. The Stoxx 600 (-1.61%) was at the lowest since March. The FTSEMIB (-1.71%) actually held in well relative to the market, though it did reach a fresh 20-month low. 10yr BTPs only rose 3.0bps and only slightly widened to Bunds (+0.5bps). The S&P fell -1.82% after Europe closed so there should be some additional catch up this morning. Looking at the data releases from yesterday. In US, September PPI and core PPI both printed in line with consensus at +0.2% mom, rising for the first time in 3 months largely on the back of higher airfares (+5.5% mom; highest since 2009) and rail-transportation costs (+1.4% mom; highest since 2012). Overall, services prices increased +0.3% mom while the cost of goods fell -0.1% mom, reflecting declines in both food and energy. The core-core PPI stood at +0.4% mom (vs. +0.2% mom expected). Across the pond in Europe, France’s August industrial production came in at +0.3% mom (vs. +0.1% mom expected) while the previous months was revised upwards to +0.8% mom from +0.7% mom and manufacturing production came in at +0.6% mom (vs. +0.1% mom expected). Industrial production also rose in Italy (+1.7% mom), Spain (+0.7%), and the Netherlands (+1.7%). These prints are likely distorted due to new regulations, but the trend signals healthy IP growth of around 1% for the euro area overall. In the UK, the August three month GDP change came in at +0.7% 3m/3m (vs. +0.6% 3m/3m expected) with August GDP remaining flat as against consensus of +0.1% mom. The UK’s August visible trade balance stood at -£11.2bn (vs.-£10.9bn expected) while the trade balance came in at -£1.3bn (vs. -£1.2bn expected). UK’s August industrial production came in at +0.2% mom (vs. +0.1% mom expected), manufacturing production at -0.2% mom (vs. +0.1% mom expected) and construction output at -0.7% mom (vs. -0.5% mom expected). Before the US CPI print today, we'll get CPI revisions in France and Spain. Later this morning, the Bank of England will publish its latest credit conditions and bank liabilities survey. The ECB will publish the minutes of its September policy meeting this afternoon, while BoE Governor Carney will speak on a panel alongside Banque de France Governor Villeroy. Concurrent with the US CPI, the latest weekly jobless claims will print.